When my aunt announced that she was pregnant, she mentioned to me that she was planning on centering the nursery around a castle them. So, off I went looking for a birth announcement with a castle. This is more difficult than it sounds. 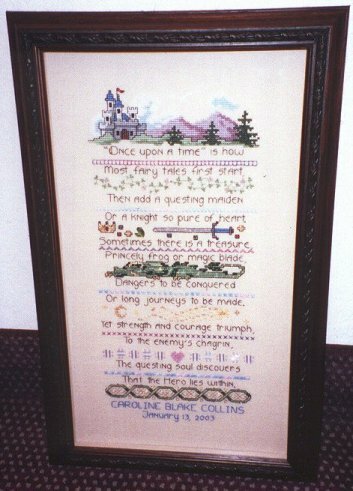 I finally found Jennifer Aikman-Smith's "Fairy Tale Sampler". I liked the poem. I liked the saying, but I needed to add the baby's name. So, at the bottom, I added the celtic knotwork border from Teresa Wentzler's Dragon Ride and borrowed the font from somewhere that I can't remember now. So, amidst learning how to sew on a Renaissance Court Costume, I managed to start and complete this piece for my newest little cousin, Caroline Blake Collins born on January 13, 2003.